I won't enter into specifics about her teaching methods. After all, you really have t take the class to get the benefit. As surface, I used a lead and maroger "priming" over the oil primed smooth linen that required some care in the handling of the brush. The brush should be held away from the ferrule. Whenever I find myself drawing with the brush I remember this is opposed to the language of painting which doesn't rely on line but tone and color shifts. 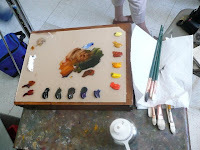 My palette included Vasari colors from New York and Old Master's maroger as a medium. I am not sure I will keep using maroger until I get a really well ventilated studio since its fumes were overwhelming and I'd like to paint for many years. 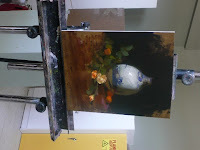 Still life demo by Sherri Mc Graw. Image copyright belongs to S. McGraw. maroger medium is really so very unsafe and unnecessay...Neoglip by Gamblin feels so very much the same...one thing that gives or enhances the silky smooth alive surface is a lead primer on the canvas and a fine tooth belgian canvas...they all help...But for the life of me...I cannot understand from a chemical point of view...why some artists think that using dangerous outmoded...methods of the old artists will make them better painters...What you mentioned of artists questioning their ways, and relationship to material and to ways of applying painting to canvas go much further...oh and using really good paints helps as well.